Glass ceramic is one of the most versatile materials, combining the properties of glass and polycrystalline. Extremely resistant to thermal shock, its applications range from cooker hobs, mirror substrates for astronomical telescopes to being used in the nosecones of high performing aircraft and missiles. What is the best adhesive for bonding glass ceramic? Glass ceramic is produced by controlled crystallisation (devitrification) of glass. The glass is melted, fabricated and converted using heat treatment. The resulting material has the same chemical composition as glass but has a 95-98% crystalline by volume. The main advantages of glass ceramics are its high strength, high impact resistance and toughness which makes it suitable for different industrial applications. The material also has a high thermal expansion and shock resistance due to its near-zero coefficient of linear thermal expansion. This means a piece of glass ceramic can be heated to approximately 700°c and then rapidly cooled and it will not fracture or break. These properties allow glass ceramics to be incorporated into appliances that need to withstand high fluctuating temperatures such as cookware, bakeware and cooker hobs. The material can be produced in different shapes, thickness, colours and printed designs can be added to improve the appearance of the application and enhance the functionality, for example the material is popular in creating interactive surfaces in cars and scanners in the optical market. We recommend the use of Permabond UV630 for its precision bonding and proven reliability. 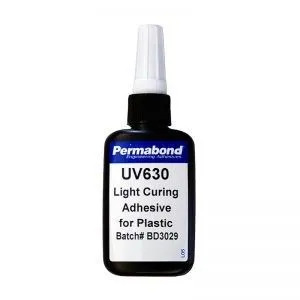 Permabond UV630 is a fast setting, UV curable adhesive with a high shear strength and impact resistance. Ideal for applications where the substrates have different heat expansions. The advantages are you can precisely position your glass material joint, apply the adhesive and cure the adhesive when you are ready. The adhesive is colourless when cured providing a better aesthetic appearance. Please note: cure times may vary depending on the lamp output, distance from between the lamp and the components, and the transmission characteristics of the substrates.